How Will Fossil Free Sustainability Investment Strategies Perform Under Trump? Last week’s post-election stock market returns offer an early indicator of how the financial markets are adjusting to the new reality. 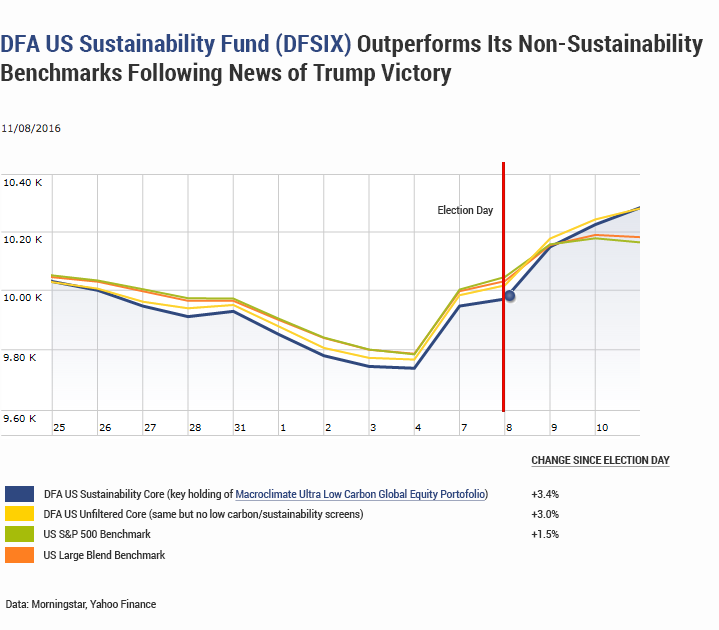 The core holding of our Macroclimate Ultra Low Carbon Global Equity Portfolio – DFA US Sustainability Portfolio (DFSIX) – was remarkably resilient. It outperformed both the unfiltered (fossil-fuel-heavy) version of the same fund (DFEOX) and the S&P 500 (also unfiltered). All three are positive. See chart above. Chart below shows DFA US Sustainability Portfolio (DFSIX) outperformance versus Exxon Mobil (XOM) — the quintessential fossil fuel company — over the past five years, including post election through December 16, 2016. Going forward, you never know which market sectors will outperform from year to year. This also applies to fossil fuel assets in the short term (1-5 years). What we do know is that financial markets reward patient, long-term investors and low-carbon energy generally has outperformed high carbon in recent years worldwide. Whether this continues to be true during the Trump administration remains to be seen. Having said that, since there’s now little doubt we’ll face significant climate change effects in our lifetimes, reducing exposure to fossil fuels is likely to offer more upside than downside for long-term investors (those with a time horizon of 10 or more years). As climate change effects intensify, downside risks of carbon-intensive assets may escalate regardless of the political environment in the 2020s. If investors — on a global scale — divert their capital from climate stressors to more climate-resilient alternatives, the risks of abrupt and irreversible climate change will be reduced.